The short story genre feels like it is a dying breed. For whatever reason, there seems to be pressure for authors to write full-length novels these days. In some cases these novels turn into trilogies, and others turn into even longer series (yes, I’m looking at you Harry Potter). While I certainly enjoy a well written full-length novel, I love a good short story. For one, it makes for a quick read that can be read in under an hour. Second, it’s a great way to sample and get introduced to an author’s writing. It’s why I was interested in reading All I Can Be: A Time Travel Story by Michael Bunker. I had heard some good things about a couple of his novels, but I figured that sampling a short story of his first would be a good way to see if I’d like his writing style in a longer format book. As you would expect in a short story, the plot is simple and straight forward. An aspiring author with a severe case of writer’s block inhabits an old cabin in the country. The hook is that the cabin’s former occupant was an author as well, a famous one. He supposedly wrote his last novel while in the cabin but refused to release it. The missing manuscript is as much legend as it is myth. Most people who knew the former author have come to believe it never existed. Either way, our aspiring author decides to move into the cabin as a means to breakthrough his writer’s block, which is where the story picks up. While I wouldn’t put All I Can Be into my Must Reads, it’s a fun, fast, entertaining read, which means I’m putting it into my Fun Reads category. 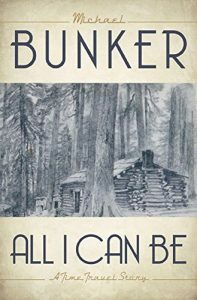 It is a great introduction to Michael Bunker and his writing style. It has enticed me to add one of his longer works to my reading list. I’ll most likely start with Pennsylvania, unless you think I should start with one of Bunker’s other works. If so, feel free to leave your recommendation in the comments. Thanks! This entry was posted in Book Reviews, Fun Reads and tagged Books, fun reads on April 3, 2019 by Gregg Borodaty.